Kashalos has his own pictorial language. Self-taught, he remained unaffected by the teachings of formal education, depicting his subject with immediacy and purity, through the eyes of a man who has remained a child. Through his simplistic visual vocabulary he brought to the present recollections of Byzantine, Post-Byzantine and folk art styles, reinvigorating archetypal forms and formats. Kashialos gives a different view of reality as he perceives it. He did not use perspective- the entire scene takes place on the surface of the composition. The figures are depicted in profile, stylized, and immobilized in their activity. They recall figures of the Karakiozi, stuck upon the surface of the work. The dimensions in his work are not based on scale, but rather depend on the importance the artist wanted to attach to particular subject he was portraying. He sometimes simplified and painted in a more abstract manner; on other occasions he focused on detail, revealing his love for a more decorative rendering of the background or other large areas. His colours are vibrant and expressive. 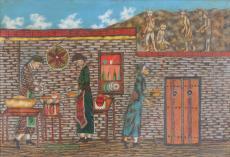 Kalikantzaroi depicts an old folk belief that exists in not only the artist’s village, but in all of Cyprus. According to this tradition, during the twelve days of Christmas – which begin on Christmas day and ending on the Epiphany- mischievous and harmful goblins known as kalikantzaroi, rise up to earth. In order to appease them, housewives must place old fashioned sweets, fried flour pittas known as xerotigana – on their roof, so that the kalikantazoi will eat them and leave. This piece by Kashialos is particularly interesting, as he depicts two scenes- one which takes place inside the house, and one outside- in one single, unified space. Kashialos produced the majority of his work in the 1960s. He was supported both by the state and important figures in the artistic and cultural world, and has since emerged as one of the most important artists of the newly formed Republic of Cyprus. Michael C. Kashalos was the first Cypriot naïve artist to have made a name for himself. He was born in the village of Assia and he lived there his entire life. He died in Larnaca in 1974, after enduring a serious injury from the Turkish army that had invaded his village. He only went to primary school, where he had some art lessons. He worked a variety of jobs, including shoemaking and pottery only becoming involved in art at around 1960, at quite an advanced age. 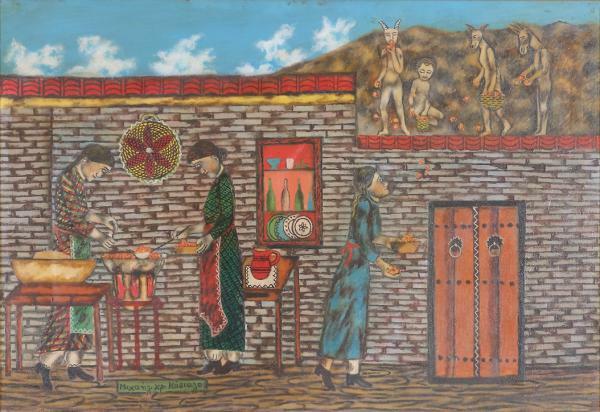 He drew his themes from the manners, customs, traditions, occupations and habits of his fellow villages. His work depicts the world as he lived it or as he remembered it, and thus contains rich folkloric material.